Not your typical home design accessory: The Baby Princess Kvik will hit you with joy and brighten up a setting. A frog and a princess. A home design piece and a game for kids. The Baby Princess Kvik spring figurine by Hoptimist encompasses all these features at the same time. Lively while still minute and compact, it flaunts an adorable appearance while at the same time an irresistible charm. Its curious eyes look around in search of attention and a nice pat on the head, making the piece shake cheerfully. 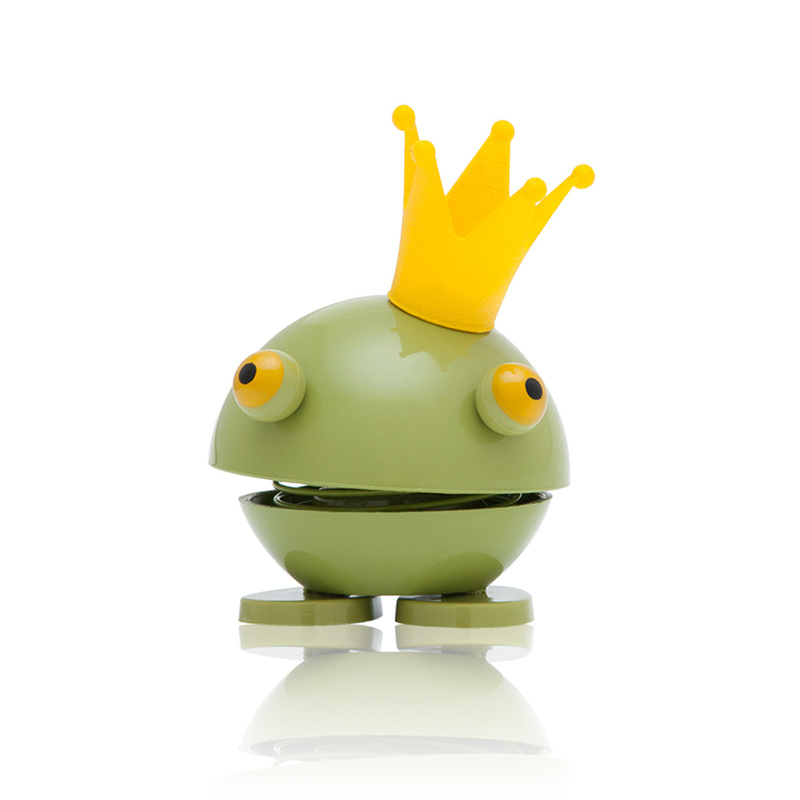 It's part of a big family filled with kings, queens and princes, as this royal frog spreads joy on even the most boring of days. An innovative idea, while at the same time bringing back memories of childhood, this piece expresses cheer and joy, joining you at work, while you cook or during downtime on the sofa. Whether it's placed on a shelf, a desk, a piece of furniture or on top of the fridge, it gives off a pleasant vibe with detail-oriented designer features that round out a furniture layout with positive emotions. The piece also adds a bright hint of colour to kids' bedrooms, where it can be good company when inventing fantasy stories. The classic story of the frog prince gets a whole new flair from Baby Princess Kvik, as the piece flaunts an adorable damsel who, in the shape of a frog, awaits her fateful kiss to turn her back into a beautiful princess. But this springy princess is so fun and lovable that there's no need for transformation! Her body is spherical and covers the spring, while not having legs but rather 2 giant feed and a gold crown that sits upon the head. Those who cross her path will notice her gentile features and will without a doubt turn to her fluttering figure when in need of boosting her mood. The design is made of high quality plastic materials that make for a durable and robust piece, while its ability to brighten the mood is just as strong. This mini princess has got it all. Except maybe the prince by her side!